The Unblock Request system is designed to streamline requests from end-users for websites to be unblocked. It's a more convenient workflow for administrators to maintain custom URL Categories and manage requests to unblock sites from within the USS portal. To ensure that end-users are able to submit Unblock Requests, you should add the $UNBLOCK_FORM$ placeholder string to an existing HTML template, and ensure that template is used by at least one Filter Rule. 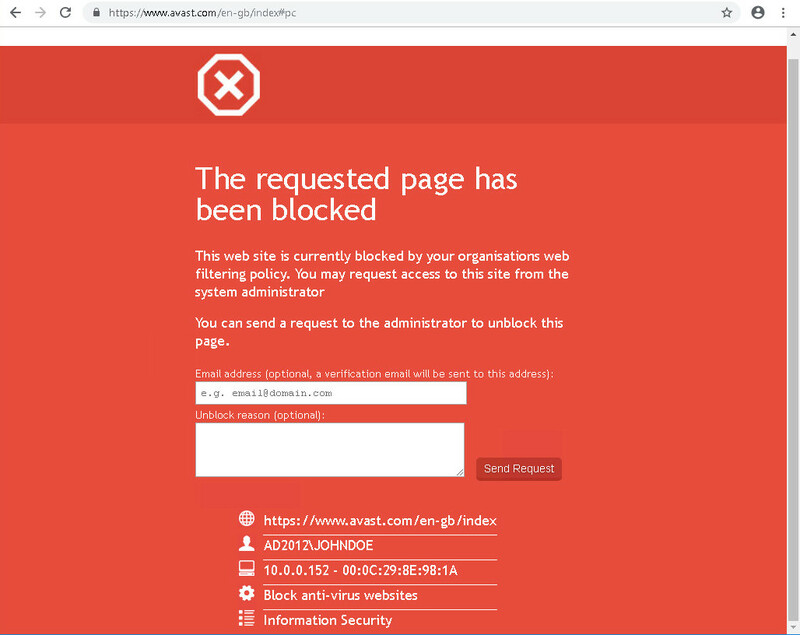 When a user performs an action that triggers the relevant Rule, the user will then be presented with a page that includes a form to send an Unblock Request. Remember, you need an HTML template with the $UNBLOCK_FORM$ placeholder string in order to receive Unblock Requests. 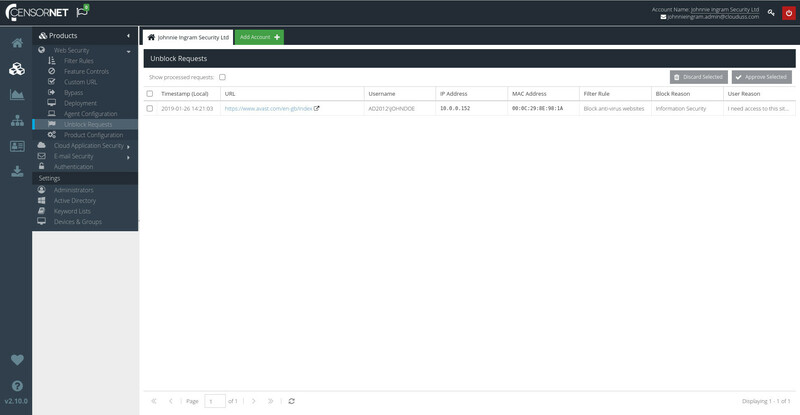 To view your current Unblock Requests, visiting your dashboard and click Products ⟶ Web Security ⟶ Unblock Requests. You can now see a list of all outstanding Unblock Requests sent by your users. If this list is empty, you currently have no outstanding Unblock Requests. You can view previously processed Unblock Requests by selecting the Show processed requests checkbox. The time in local time at which the Unblock Request was received. The full URL that was blocked. The username of the end-user that submitted the request, if User Authentication or User Identification is enabled in the Agent Configuration Profile. The IP address of the device from which the request was sent. The MAC address of the device from which the request was sent. The name of the Rule that triggered the block. The category reported by the Rule that triggered the block. The text entered by the user in the Unblock Request form. This text is optional, and may therefore have been left blank by the user. Approving simply means that you have actioned the request in some way. It does not guarantee that the website is unblocked - that depends on the configuration of your Filter Rules. 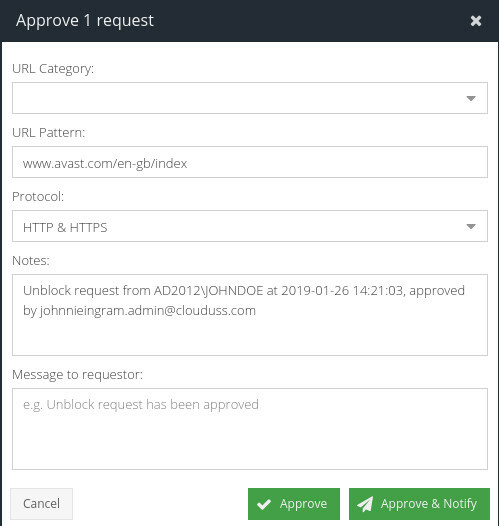 To Approve any number of requests, first select the requests you want to Approve (by clicking the checkmark next to the request on the Unblock Requests screen). You can select all outstanding requests by clicking the "select all" checkbox at the top of the list. Then, simply click to Approve all selected requests. All of the requests you select will be approved by adding them to the same URL Category and with the same Protocol. When you Approve an Unblock Request, the Manage Unblock Request dialog will be displayed. Choose a custom URL Category to which the newly-approved URL will be added. The custom URL Category will be updated to permanently include the new URL. You must have created at least one custom URL Category in order to approve Unblock Requests. Specify a version of the URL that is compatible with the URL Category. Dynamic URLs containing query strings are not compatible with the URL Category module. If your users are requesting dynamic URLs to be unblocked, it's probably more sensible to make a change to a different part of the Filter Rule (such as Keyword Categories). The protocol from the original URL that will form the basis of a new URL Category pattern. Choose between HTTP, HTTPS or HTTP & HTTPS. A description of why the Unblock Request was approved. This message is optional, and will only be visible to administrators within the Web Security product. An optional short message that can be sent to the user, if the user has specified an email address for notifications. Click to add the new URL pattern to the chosen URL Category, or if you wish to also notify the end-user. If the end-user did not provide an email address, the Approve & Notify button will not be displayed. Depending on the configuration of your Filter Rules, the site might still be blocked (by a different Rule). If an Unblock Request requires no action, or if you want to delete it, select the request from the Unblock Requests screen and click . You can choose to either discard the request, or to discard the request and notify the end-user. If the end-user did not provide an email address, the Discard & Notify button will not be displayed. You can view all previously actioned Unblock Requests (approved and discarded) by selecting the checkbox at the top of the Unblock Requests screen. The Unblock Requests screen will now display all previously processed requests, along with their status (approved or discarded) and some basic details. To switch back to the list of pending requests, simply deselect the Show processed requests checkbox. You can specify an email address which will receive a message as soon as an end-user submits an Unblock Request. To do so, visit your USS Dashboard and click Account Settings ⟶ Notifications. If you don't want to receive email notifications for Unblock Requests, just leave the Send Unblock Request notifications to: field blank.